Getting acquainted with the shop roaster while it warms up. Mi-Ji, on the left, professional keener. Along with meeting Professor Yue, we found that the fine folks from Proaster (Taehwan Automation Co) were at the Expo showcasing their machines. I became aware of Proaster in Portland, Oregon at the SCAA Event last year when I was a station instructor for some roasting courses. I got the chance to play on a 1.5 kg model at the time, and the learning curve was rather quick. Each roaster comes with on-board temperature gauges (outer drum and bean temp), timer and airflow controls. Smooth operation doesn't even begin to describe what working with one of these machines is like. It's a very intuitive, powerful machine. The 60 kg model (the roaster capacity, not me). At their booth, I met Mi-Ji Kim, their Overseas Sales Manager, and Si-Wook, the engineer at-hand, very keen and friendly people who welcomed us as if we were esteemed guests. 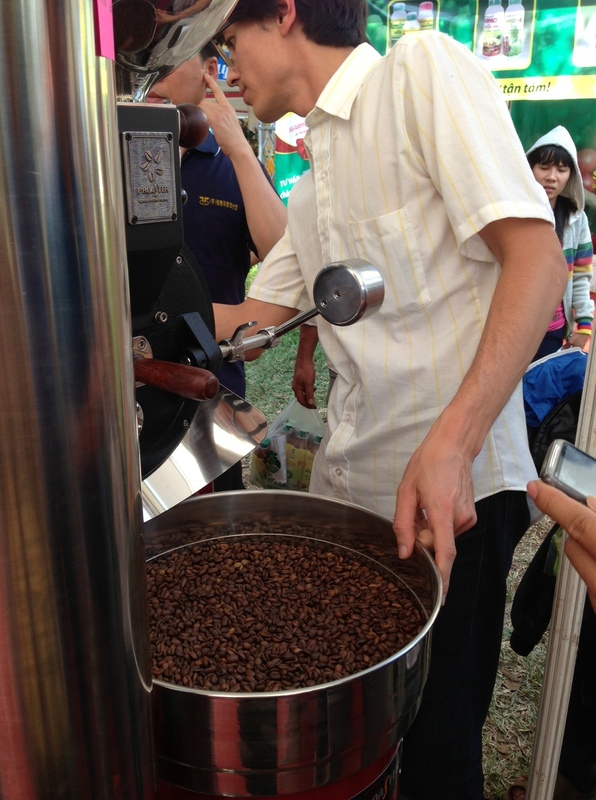 I told Mi-Ji about my experience in the US Specialty Coffee industry and that I missed roasting very much. She apologized that the sample roaster wasn't hooked up to a gas source, but pointed to the 1.5 kg shop roaster and invited me to have a go. I fetched a green sample I had and said that I'd like to roast it. She grimaced a little and said that the smallest batch it could do was about 350 grams, which was about what I had. She asked Si-Wook to warm up the machine and said it would be about 20 minutes. We took the opportunity to walk around and look at the rest of the Expo (we took a bit longer, as that's when we met Professor Yue from the previous post). When we returned, everything was ready to go and I hopped to it. Although I had used this model once before, my experience with this system is very limited. I used it in ideal conditions (indoors with climate control) and with a full batch, which is much easier to control. This time around, we were in 90-degree (F, about 33 C) heat with a tiny batch. The roast was about twice as fast as I would have liked, with the turnaround time happening at about 1 minute (I usually aim for 1:40 - 2:00). I somehow avoided scorching and tipping the roast, opening the airflow damper and turning down the heat quite a bit. Being an electric roaster, the heat response was a touch slow, but that probably kept me from over-correcting. I'm pretty bad at on-the-spot unit conversions, and Mi-Ji didn't know how to change the digital thermometers over to Fahrenheit without the manual, so I had to roast by sight and smell. As the coffee yellowed, I increased the airflow from 2 (about 20%) to 8, which helped to tame the heat a little. First crack was at around 4 minutes and I started to feel doom and gloom. Way too fast, Frith. The tryer was just the right weight and sample size. What a fun machine! As I neared the end of the roast, I began to appreciate the weight and sample size of the tryer. It was balanced and didn't let me spill beans all over (I love you Diedrich), and was machined well enough for quick removal and insertion. A small crowd started to form around me, which made my heart jump a little more, though I kept my cool and offered the tryer around to smell the coffee (Vietnamese coffee roasting plants are off-limits to just about everyone and very few shops have roasters on display for their customers, so folks were very curious). At about the five-and-a-half minute mark, I knew we were close to the end (dang, I really wanted to slow it down a lot). I tried to keep it in the drum as long as I could after that, but by 5:45 I knew second crack wasn't far away, so I ended it then and there. The end product smelled really nice and the Proaster Team couldn't wait to brew it up. They didn't have a grinder on-hand, so I took some coffee over to a booth nearby and asked if I could try out a grinder, which they obliged without hesitation. I gave them a little cupful of beans as a thanks, and they were grateful. I told them it was very expensive coffee from Ethiopia and big smiles beamed around (well, very expensive for this market, anyway. Ethiopian coffee is highly respected in Vietnam among industry folks). I jogged back to the Proaster booth with a dumb smile and the ground coffee and Mi-Ji grabbed her Clever Dripper to begin brewing. Four minutes later, we were enjoying tiny cups of surprisingly-delicious fresh-roasted coffee. It was a little too fresh, but berries, lemonade, jasmine and caramel were definitely present in the cup, and everyone was pleased. I split the rest of the coffee into two bags and shared with my new friends, who were stoked. So was I.
Mi-Ji encouraged us to visit them again tomorrow and Monday to play a little more and maybe learn the system a little more intimately. I smiled and of course agreed immediately.